Celebrate, learn & grow at Earth Festival, tomorrow at Croft Farm! It looks like a beautiful day is on tap tomorrow for the 5th annual Art Blooms Earth Festival, set for 10 a.m. to 2 p.m. at historic Croft Farm, 100 Borton's Mill Road. 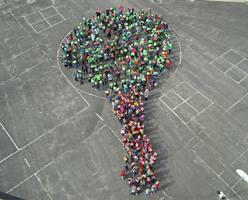 This morning, the students, faculty and staff at Russell Knight Elementary School (pictured here) formed a giant cherry tree outside the school to show their excitement for Earth Fest! Come out and enjoy for yourself and the more than 90 displays, vendors and activities, including e-waste recycling collection, a family-friendly bike ride, entertainment, healthy food choices, and a special appearance by the Phillie Phanatic! This annual celebration of community and sustainability is hosted by Cherry Hill Township in partnership with Sustainable Cherry Hill. For event highlights and more information, click here or visit www.sustainablecherryhill.org. The festival is made possible in part by generous presenting sponsors: Hutchinson Plumbing, Heating and Cooling, LourdesCare of Cherry Hill and Ravitz Family Foundation; Leadership sponsors include: Sustainable Camden County, Investors Bank, M. Rosenblatt Roofing and Flaster Greenberg. For more Earth Festival information, contact Brenda Jorett at Brenda@brendajorett.com. Earth Festival is the kick-off to Art Blooms, an annual celebration of local arts and culture, hosted by Cherry Hill Township. Art Blooms runs from April 26 to May 10, and features a wide array of events and entertainment - including the annual Juried Art Exhibit, which features original two-dimensional works in watercolor, pastels, oils and more. A special Opening Reception will be held from 6-8 p.m. Saturday, April 26. Artists will be on hand, and refreshments will be served. The Gallery will also be open from 10 a.m. to 2 p.m. tomorrow, 1 to 7 p.m. from April 28 through May 1, and from 1 to 7 p.m. May 5-9. For more information, call (856) 488-7868 or email Arts@chtownship.com. For more information on Art Blooms or other activities and events planned by the Cherry Hill Arts Advisory Board, click here. Several other special events will round out this year's Art Blooms celebration, including a special Mother-Daughter Mad Hatter Tea Party, which is new for this year! The full lineup is below; to purchase tickets for any of these events, visit the Recreation Department, Room 102 of the Municipal Building, call (856) 488-7868, or email Events@chtownship.com. All events will be held at Croft Farm. • Luncheon with the Arts for Seniors featuring “Mona Lisa Smile,” from 11 a.m. to 2 p.m. Friday, May 2. Tickets are $5 in advance/$8 at the door. • Mad Hatter Tea Party, from 2-4 p.m. Saturday, May 3. $15 for 2 tickets; $5 each additional person. • Ensemble Concert: The Great Italians, 3 p.m. Sunday, May 4. Tickets are $15, $12 for seniors with a Gold Card, or $5 for students. • The Luck Brothers blues, soul and classic rock, 7-9 p.m. Saturday, May 10. Tickets are $5 in advance or $7 at the door. For more information about Art Blooms or any event sponsored by the Cherry Hill Arts Board, please visit http://cherryhillarts.blogspot.com/. On Wednesday, I joined Woodcrest Elementary School, the Cherry Hill School District, Recyclebank and Sustainable Cherry Hill to present Woodcrest Elementary School's Green Team with a $2,900 Recyclebank Green Schools grant. The funds will be used to enhance the school's Peaceful Garden, and turn it into an outdoor classroom that will provide students with hands-on lessons in environmental preservation and much more. 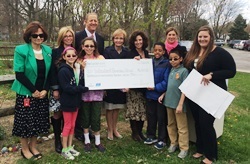 Approximately $2,400 of the grant was funded by Cherry Hill residents who graciously donated their own Recyclebank Points as part of the Green Schools program. A matching donation of $500 has been provided by Recyclebank partner Domtar. This was truly a community effort, and I'm proud to see it move forward. My hope is that Woodcrest's successful Green Schools project will serve as a model for other schools in our community, and encourage them to apply for the grant in future years. In a time when ever dollar counts, partners like Recyclebank and programs like Green Schools can provide the tools needed to supplement traditional classroom learning and make a real difference in the lives of our children. To read more about Woodcrest's project, click here; to learn more about the Green Schools program, click here. This program will feature late-18th-century to early-20th-century Haddonfield Gardens, including photographs of Elizabeth Haddon Estaugh's garden dating from 1713, which contains her famous Yew Trees and Boxwoods. Presented by Katherine Tassini, librarian at the Historical Society of Haddonfield. This event is free and open to the public. Registration not required. Scratch is a low-threshold-of-entry programming tool designed for children ages 8 to 16, yet adults find it useful as a great platform for developing games, animations, interactive stories and more. Begin to learn coding and creation. Free, hands-on computer class. Click here to register. Join us for a collection of interactive skits created by the 6th grade Cadette Girl Scouts to teach kindness and confidence. A friendship bracelet craft will follow. Best for children in kindergarten through third grade. Free, but registration required. Click here to register. 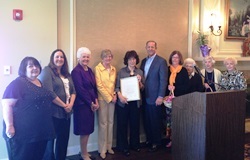 On Thursday afternoon, I presented a special proclamation celebrating the Friends of Barclay Farmstead 40th anniversary, at their annual luncheon at Tavistock. The Friends were founded in late 1975, a year after Helen Barclay sold the last 32 acres of her family's farm to the Township, to promote and help restore the historic Farmstead, and to raise money to support its maintenance "for charitable, educational and recreational purposes." Throughout the years, the Friends have played an integral role in ensuring the Farmstead's success, hosting events like Holiday House and monthly tours, and supporting the Living History School Tours and other programs that have allowed generations of Cherry Hill residents to explore and enjoy this important piece of our history. The support of the Friends has helped this historic gem to thrive, and it was my honor to celebrate this milestone in their own history. Congratulations! As of Monday, April 28, all Ellisburg Post Office operations will be relocated to a temporary, full-service trailer stationed in the rear parking lot of the Ellisburg Shopping Center, adjacent to the Playdrome. Again, all postal retail services will be available in the trailer. Post Office Box numbers will remain unchanged; however, P.O. Box customers will be required to pick up box keys for the new location. The Post Office will use the temporary trailer until a new, permanent location is found for the Ellisburg branch. For more information, call (856) 424-0093. The Merchantville-Pennsauken Water Commission (MPWC) is planning a water-main replacement project that spans Hinchman Avenue through Plymouth Place in Merchantville. Work will begin in May, and last about four months. Customers' water service is not expected to be interrupted during construction. To ensure that residents remain adequately informed of the project's scope and other details, the MPWC will host a public meeting for residents at 7 p.m. Monday, May 5, at the Merchantville Community Center, 212 Somerset Ave., Merchantville. For more information on the project or the May 5 meeting, please contact the MPWC at from 8 a.m. to 4 p.m. Monday through Friday by calling (856) 288-2900. Congratulations to the Cherry Hill Alternative High School, which was honored at this month's meeting of the Camden County Board of Freeholders. The school has been named as a finalist in the 2014 National School of Character Competition, and is awaiting final word on this year's national award winners. Freeholder Ian Leonard presented a proclamation to Mrs. Dianne O'Brien, chair of the school's Character Education Committee, and several students. The Township is proud of the recognition the school's ongoing Character Education efforts, and we look forward to honoring the students at an upcoming Council meeting, as well. Registration is now open for two community-education classes offered through the Cherry Hill Fire Department. For more information on either class, visit the Fire Department's website, call (856) 795-9805, ext. 1333, or email tdelucca@chfd.org. The Cherry Hill Education Foundation presents the 2014 “Dancing with the Cherry Hill Stars” next Sunday, May 4 at 7 p.m. in the Auditorium at Cherry Hill High School West. Sixteen couples, including teachers, students, school administrators, alumni and members of the business community, will compete in an exciting contest to raise money for the Cherry Hill Public Schools. Special performances by the Cherry Hill School Board (with students), and by last year’s “Jersey Boys” will enhance the show. Guest celebrity judge Jeremiah Trotter will join the judges’ table with Marjie Major, Katie Nanni and Arnie Silver. Music by East’s Orchestra will add to the elegance of this “Hollywood” evening. Tickets are available online at www.cherryhilleducationfoundation.com or in the Activities Offices at Cherry Hill High School East and West. Online voting for your favorite dancing couple is also available on the Education Foundation’s website. Come out and enjoy for yourself and the more than 90 displays, vendors and activities, including e-waste recycling collection, a family-friendly bike ride, entertainment, healthy food choices, and a special appearance by the Phillie Phanatic! This annual celebration of community and sustainability is hosted by Cherry Hill Township in partnership with Sustainable Cherry Hill. For event highlights and more information, click here [http://www.cherryhill-nj.com/CivicAlerts.aspx?AID=502] or visit www.sustainablecherryhill.org [http://www.sustainablecherryhill.org/] . The festival is made possible in part by generous presenting sponsors: Hutchinson Plumbing, Heating and Cooling, LourdesCare of Cherry Hill and Ravitz Family Foundation; Leadership sponsors include: Sustainable Camden County, Investors Bank, M. Rosenblatt Roofing and Flaster Greenberg. For more Earth Festival information, contact Brenda Jorett at Brenda@brendajorett.com [mailto:Brenda@brendajorett.com] . Earth Festival is the kick-off to Art Blooms, an annual celebration of local arts and culture, hosted by Cherry Hill Township. Art Blooms runs from April 26 to May 10, and features a wide array of events and entertainment - including the annual Juried Art Exhibit, which features original two-dimensional works in watercolor, pastels, oils and more. A special Opening Reception will be held from 6-8 p.m. Saturday, April 26. Artists will be on hand, and refreshments will be served. The Gallery will also be open from 10 a.m. to 2 p.m. tomorrow, 1 to 7 p.m. from April 28 through May 1, and from 1 to 7 p.m. May 5-9. For more information, call (856) 488-7868 or email Arts@chtownship.com [mailto:Arts@chtownship.com] . For more information on Art Blooms or other activities and events planned by the Cherry Hill Arts Advisory Board, click here [http://cherryhillarts.blogspot.com/2014/01/annual-art-blooms-juried-art-exhibit.html] . Several other special events will round out this year's Art Blooms celebration, including a special Mother-Daughter Mad Hatter Tea Party, which is new for this year! The full lineup is below; to purchase tickets for any of these events, visit the Recreation Department, Room 102 of the Municipal Building, call (856) 488-7868, or email Events@chtownship.com [mailto:Events@chtownship.com] . All events will be held at Croft Farm. For more information about Art Blooms or any event sponsored by the Cherry Hill Arts Board, please visit http://cherryhillarts.blogspot.com/ [http://cherryhillarts.blogspot.com/] . Approximately $2,400 of the grant was funded by Cherry Hill residents who graciously donated their own Recyclebank Points as part of the Green Schools program. A matching donation of $500 has been provided by Recyclebank partner Domtar. This was truly a community effort, and I'm proud to see it move forward. My hope is that Woodcrest's successful Green Schools project will serve as a model for other schools in our community, and encourage them to apply for the grant in future years. In a time when ever dollar counts, partners like Recyclebank and programs like Green Schools can provide the tools needed to supplement traditional classroom learning and make a real difference in the lives of our children. To read more about Woodcrest's project, click here [https://www.recyclebank.com/contest/index/school/id/105/] ; to learn more about the Green Schools program, click here [https://www.recyclebank.com/about-us/green-schools] . Scratch is a low-threshold-of-entry programming tool designed for children ages 8 to 16, yet adults find it useful as a great platform for developing games, animations, interactive stories and more. Begin to learn coding and creation. Free, hands-on computer class. Click here [http://host6.evanced.info/cherryhill/evanced/eventsignup.asp?ID=5467&rts=&disptype=&ret=eventcalendar.asp&pointer=&returnToSearch=νm=0&ad=&dt=mo&mo=5/1/2014&df=calendar&EventType=ALL&Lib=&AgeGroup=ALL&LangType=0&WindowMode=&noheader=&lad=&pub=1&nopub=&pa] to register. Join us for a collection of interactive skits created by the 6th grade Cadette Girl Scouts to teach kindness and confidence. A friendship bracelet craft will follow. Best for children in kindergarten through third grade. Free, but registration required. Click here [http://host6.evanced.info/cherryhill/evanced/eventsignup.asp?ID=5510&rts=&disptype=&ret=eventcalendar.asp&pointer=&returnToSearch=νm=0&ad=&dt=mo&mo=5/1/2014&df=calendar&EventType=ALL&Lib=&AgeGroup=ALL&LangType=0&WindowMode=&noheader=&lad=&pub=1&nopub=&pa] to register. Registration is now open for two community-education classes offered through the Cherry Hill Fire Department. For more information on either class, visit the Fire Department's website, call (856) 795-9805, ext. 1333, or email tdelucca@chfd.org [mailto:tdelucca@chfd.org] . Refresher Program for Lifeguards: For the 15th year in a row, the CHFD offers this in-service refresher class for lifeguards at the William G. Rohrer Center for Health Fitness in Voorhees. This year's class will include a CPR recertification. For course dates and additional details, click here [http://www.cherryhill-nj.com/DocumentCenter/View/2178] . To register, email Dr. Elizabeth Speakman at Elizabeth.speakman@jefferson.edu [mailto:Elizabeth.speakman@jefferson.edu] . 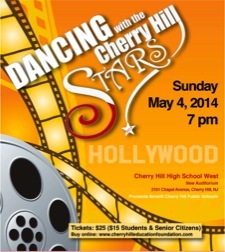 The Cherry Hill Education Foundation presents the 2014 “Dancing with the Cherry Hill Stars” next Sunday, May 4 at 7 p.m. in the Auditorium at Cherry Hill High School West. Sixteen couples, including teachers, students, school administrators, alumni and members of the business community, will compete in an exciting contest to raise money for the Cherry Hill Public Schools. Special performances by the Cherry Hill School Board (with students), and by last year’s “Jersey Boys” will enhance the show. Guest celebrity judge Jeremiah Trotter will join the judges’ table with Marjie Major, Katie Nanni and Arnie Silver. Music by East’s Orchestra will add to the elegance of this “Hollywood” evening. Tickets are available online at www.cherryhilleducationfoundation.com [http://www.cherryhilleducationfoundation.com/] or in the Activities Offices at Cherry Hill High School East and West. Online voting for your favorite dancing couple is also available on the Education Foundation’s website.